Steel is one of the most commonly used materials in the world. That said, people often forget that there many types of steels, each with their own differing properties and uses. According to the World Steel Association, there are more than 3,500 different grades of steel with vastly different properties. With all of these varieties of steel available for purchase on the market, it’s important to remember that not all types of steel are considered equal. When it comes to fittings, you NEED to be using stainless steel. When it comes to choosing a steel fitting, your primary options are stainless steel or carbon steel. So, what’s the difference? 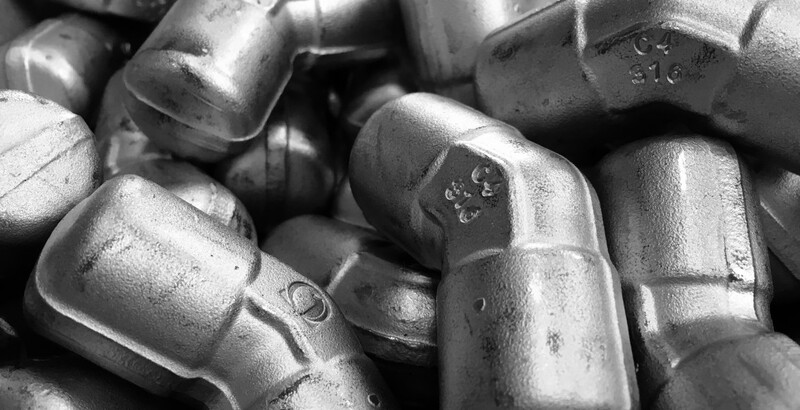 These seemingly-subtle differences in chemistry have plenty of significant real-world effects, especially when it comes to manufacturing and using steel fittings in production settings. 1. Stainless steel is more rust-resistant. Rust can cause a lot of problems in manufacturing environments, including wearing down of the metal material. Fortunately, stainless steel does not easily corrode, rust, or become stained by water. Since stainless steel is composed of at least 10.5% chromium, the chromium is able to form a protective layer of chromium oxide on the surface of the metal, which blocks the corrosion from occurring. Conversely, unprotected carbon steel rusts and corrodes easily when exposed to air and moisture, and is therefore not ideal in these types of environments. 2. Stainless steel is more acid-resistant. Stainless steel is generally very resistant to corrosion and damage from acids. This usually varies based on the type of stainless steel as well as the type of acid, but all types of stainless steel are corrosion-resistant when faced with phosphoric acid. 3. Stainless steel is less brittle. Stainless steel fittings are less likely to split and crack than other types of steel, ensuring pressure containment. All OmegaOne fittings are made from stainless steel in the United States. Learn more about our fittings here, or contact OmegaOne today for help finding the right stainless steel fitting for the job.